Our school’s Highland Games take place tonight. The kids are high as kites and the corridors are mayhem. I’m taking a little breather before venturing out again into the partly assembled tents and stalls which are filling up the sport’s field. Being a slightly more confident baker than last June, my donations to the cake stall this year include Holler’s mum’s fruitcake, Johanna’s grubs, white chocolate & walnut brownies, Scottish Tiffin, lemon poppy seed loaf and various forms of Finnish pulla. Pulla is a Finnish sweet bread made with cardamon and traditionally eaten with coffee. It takes many forms and (after making the basic dough) I tried to recreate three: voisilmspullat, korvapuusti and normal pulla. The latter is a simple braided loaf. Voisilmapullat means “butter eyed rolls” and is a cardamon bun baked with a butter filled dent in the centre. 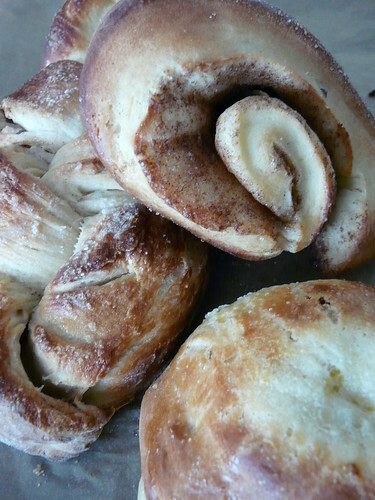 Korvapuusti, which means “slapped ear”, are my favourites and are huge spiral cardamon buns filled with a sugary cinnamon butter. I love Pulla! You certainly baked a lot. I hope the Games went well. Oh! They look lovely! I am assuming you are feeling much better if you are up to all the baking! My husband comes home from Scotland on Friday and I have to say he has really enjoyed his time there. He promises to take me with him one day. Have a wonderful evening at the games! Hope you have fun and are not too exhausted at the end of it! Those buns look really good, I will look forward to that recipe. Were they tricky? You’re so lucky to be able to have a cake stall at your school. I’m on the parent council for my kids’ school and I asked about doing a cake and candy stall at the summer fair. I was told that it’s not allowed and we had to have a fruit and water stall instead. This is because of the food police worrying about people being poisoned by homebaked cakes from unhygenic kitchens and the promotion of ‘healthy eating’. As far as I’m concerned cake ‘n candy is an important part of our Scottish heritage! So I’m looking really forward for the perfect recipe!! The look is amazing..so delicious! For being you first attempt my dear ..good job indeed!! Jane: We also agree that part of Scotland’s proud heritage is its homebaking and most definitely sweets! To this end Granny Jackson’s set up a Scottish Sweets Network at http://ScottishSweets.ning.com and it would be great to hear some of your views there too. We also participate in many Highland Games around Scotland – a great tradition. Next question for the forum… what do you think about next year’s Homecoming Scotland? David – It’ll be coming soon! Notquitejuneclever – Very glad to hear that your husband got on so well. Hope you get to join him next time! Holler – Making the dough is a bit tricky but forming the buns is easypeasy. Jane – No way?!?!?! That’s ridiculous! I’m absolutely stunned. Silvia Magnolia – Thank you so much! Johanna – Still feel like a novice, I must say. A more confident novice though. Thanks again for the grubs recipe! Granny Jackson’s – Lovely that you have a thriving business out of something so fun and traditional. Oh! Those look delicious. Cardamom is one of my favorite spices. I’m looking forward to your recipe. I’ve never made such beautiful buns before, but I do make bread, so maybe I can manage it. Sarah – I’m absolutely sure you can. In fact, you’ll make them better than me as I never bake bread! Recipe will be here next month sometime. On holiday then, so will have the time to tinker!